Since political journalists so love to talk about Labor Party narrative, I think it’s time we turned the tables and talked about mainstream media narratives instead. The one I would like to specifically discuss is the media’s recent coverage of the one year milestone of the Abbott government. From what I have seen and heard so far, these are the mandatory ingredients of the media’s narrative marking this occasion, with the consistency of a wheel in a track. This review of the media narrative also, handily, becomes my critique of Abbott’s first year as Prime Minister. One stone, two dead birds and all that. Abbott is given a big thumbs up for doing what all Prime Ministers were expected to do until he broke pretty much every promise he made during his first twelve months and Teflon-like changed the expectations that a Prime Minister shouldn’t lie. 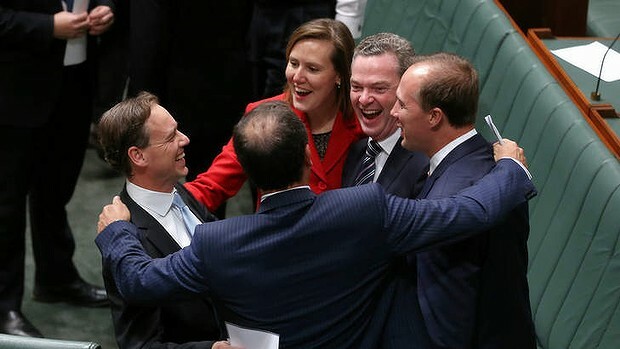 So on the three occasions that Abbott didn’t lie – promising to get rid of the Carbon Price and Mining Tax and stopping the boats, he gets a round of applause from the mainstream media. This applause definitely does not include any critique of the effect these decisions will have on the community. Because discussion of policy outcomes is forbidden. All the journos need to know is that Abbott said he was going to get rid of the Carbon Price, the Mining Tax, and stop the boats and he’s done that, so big tick to Abbott! You’ll see no comment on the devastation that the demise of the Carbon Price, with no policy to replace it, will have on our environment, even though a study has already reveals that emissions went up immediately after the repeal. You’ll see no comment on the impact of the death of the Mining Tax on wealth inequality. And has Abbott really stopped the boats if they’re still leaving Indonesia only to be turned around in secret military-like on-water operations that break international treaties and desperate people are sometimes sent back to the hell-hole they came from? One murdered asylum seeker and one death due to sub-standard third-world medical care and a damaged relationship with Indonesia doesn’t seem to me to be a successful policy. But if it kept a promise, it’s fine apparently. However, if you cared to judge the Abbott government not on their ability to keep a promise, but on their ability to be humane and to work in the best interests of the community while keeping a promise, they have clearly failed. You won’t hear the media making this point. It is clearly not hard to put some glasses on and to look sombre while you speak pre-prepared consolatory words about an airline tragedy. And let’s be honest people, if that’s Abbott at his pre-prepared best, then he’s at best a mediocre public speaker who should never have got anywhere near the top job and at worst a George. W. Bush-like moronic bumbling ah-ah-ah-ah embarrassment to this great nation. So looking past what Abbott said, as he scheduled non-stop press conferences about plane disasters but wouldn’t talk about his failed budget, and focusing more on what he did, what did he actually do? He volunteered millions of dollars in Australian resources and never found Malaysian Airlines flight MH370, despite raising the victim’s family’s hopes unnecessarily and announcing in Parliament that the plane had been found when it hadn’t. He also volunteered Australian resources to help recover the bodies of victims of Malaysian Airlines flight MH17 which, sorry to have to point this out, again raised the hopes of the victim’s families and again he failed to complete the mission, whilst also putting Australians in harm’s way. Apparently it’s ‘statesmen like’ to rush to a war on terrorism. Talking about the merits of going to war for at least a few days before committing Australia to what could be an ongoing conflict in a country that still hasn’t recovered from the last time Australia rushed to help America and the UK wage a war, would to me, seem at least foolish, at worst criminal. But Abbott’s Team Australia khaki campaign, in aid of his personal polling, will no doubt be applauded by the press as long as it continues to help Abbott win the poll war. Because that’s how journalists judge the merits of a Prime Minister’s decisions – on their real or possible impact on polls. Didn’t you know? Even when journalists do bother to remind voters that Abbott’s first budget was based on a barrage of lies and broken promises, they always make sure to compare these lies to Gillard’s Carbon Price ‘lie’. A lie is something you know to be false when you say it. Gillard didn’t know she was going to have to make a deal with the Greens to form minority government when she said she had no intention of implementing a tax on carbon, and instead preferred an ETS. So if you believe Abbott is in the same boat as Gillard in saying no cuts to education, no cuts to health, no cuts to the ABC or SBS numerous times throughout the election campaign, and then immediately back flipping on all these promises because he was forced to by a change of circumstances, then where are the changed circumstances? Abbott didn’t need to make deals in the lower house to put his budget together (although deals with the Palmer United Party over superannuation cuts in order to kill the mining tax are surely as close as Abbott has got to circumstance like Gillard’s Carbon Price policy). We could go on discussing the blatant differences between Abbott’s huge list of broken promises that culminated in the most unfair and cruel budget this country has ever seen, to Gillard’s decision to introduce a Carbon Price. But the biggest difference I would like to point out, which you never hear a journalist mention is a really simple one and also such a whopping big one that it’s hard to know how journalists can even look at these two situations without seeing the gulf of difference between them. Simply, Abbott’s lies made ordinary Australians worse off. They are bad policies on every single measure you care to measure them by and were ideological assaults based on the lie of a budget emergency. Gillard’s decision to bring in a Carbon Price, followed shortly thereafter by the policy she did say she wanted to bring in – an ETS – is good policy that is good for the environment and an important step in the international challenge to mitigate climate change. But journalists either don’t or can’t seem to see the difference between good policies and bad policies. Are they scared to judge a policy in case they appear partisan? What is the point of political journalism if not to inform the public on the merits of public policy? Seriously, what is the point? It’s a bad budget just because it’s bad. Full stop. So there you have it. You’ll see this narrative over the next few days. Of course there will be, thankfully, examples of journalistic work that swims against this narrative, and good luck to those brave people. I know that one year into Abbott’s government, the one thing I am most sure about is that if a Labor government had behaved even a little bit like the Abbott government has in their contempt for the voting public, the mainstream media would have drawn and quartered Labor by now. The lack of contempt for the Abbott government from our media is, quite frankly, alarming. I agree completely with your assessment of Abbott’s performance – and what a performance it was, up to and including his attempt at ‘elder statesman’ over the MH17, which was a golden (and blatant) piece of opportunism to divert attention from the budget. But I don’t altogether agree about the media take on it. But maybe that’s because I don’t read the Murdoch press. Another good article and really kicking the major problem with Australian mainstream media in the guts for not reporting more on Abbotts 13 broken promises to the Australian public. Yes we all knew that Abbott would get rid of those big three like the carbon tax and mining tax which did bring in much need tax flow. It was Rudd who put the footprint back into STOPPING THE BOATS while Abbott and Morrison only towed them back which broke off interactive relationships for that made the Indonesians loose face in the international world. In other words the Indo’s were not very happy chappies. It was Julia Gillard that lifted the veil on the uranium export to India who was not a signature to the Non Proliferation Treaty and made his own up which can be torn-up at anytime by India if they want to enrich the uranium down the track. The promise of opening up free trade negotiations with India only means one thing for Australian Workers. More jobs to go off shore and increased 497 sub class workings into Australia. So far 13 broken promises that directly affect poor class Australians while the few well off get off scot free including Clive Palmer. Thanks Clive for ripping the guts out of Australia’s Superannuation Guarantee fund just so you don’t have to part with some of your stolen cashflow. Which leaves the latest ABC members poll on the Drum showing that Abbott the Rabbit falling backwards in popularity for a change. How do you rate Tony Abbott first year as Prime Minister and this staggering number 24576 within 24 hours showed that Abbott his not liked that much. Actually the totally bad was hovering around the 75% mark until those Abbott lovers brought the number back down to the actual number representing those L-NP trolls. Should Australia be selling Uranium to India while this poll as I write to your blog Victoria has 4263 ABC voters counted while the no’s have 76% while the Yes has 18% and undecided hovering around the 6%. You do realise that self-selected surveys as they have on the drum have all the statistical significance of reading tea leaves? The ABC is as friendly to the coalition as if you were to conduct the survey at the AWU annual convention. Any credible surveys you could cite with similar percentages? Those surveys are as accurate as the ones fed to us by the mainstream media. Some pollsters only ring landlines – leaving a significan percentage of the population out of it and usually during working hours, so pensioners are likely to be those people polled. What they do is indicate trends and those have typically been unfavorable to the government. formal pollsters factor in for the biases in their sampling. Self selected surveys remain as reliable as looking at chicken entrails. Convince me that the ABC drum surveys are representative of all the electorate rather than the visitors to the drum. the last comprehensive survey was at the last election, with a 100% sample size.